Don’t call the Bulls a .500 team. That’s because with their fourth straight victory, and third this season over Cleveland, the Bulls Saturday defeated the Cleveland Cavaliers 117-99. The Bulls pulled away with a dynamic third quarter, outscoring the Cavs 32-20, and then held off Cleveland throughout the fourth quarter. The Bulls moved to 30-29 on the season as the Cavs fell to 40-17. They are 0-4 this season without LeBron James, who didn’t play, and 4-19 without James overall. The Bulls were again led by Dwyane Wade, this time with 20 points, 10 assists and nine rebounds. Jimmy Butler had a triple double with 18 points, 10 rebounds and 10 assists. The Bulls had seven players in double figures with Rajon Rondo scoring 15, Nikola Mirotic with 14 points and 20 rebounds and Cristiano Felicio with 10 points and strong pick and roll defense down the stretch. The Bulls again, like against the Suns Friday, racked up more than 30 assists and double digits three pointers made, this time a season most. James was out ill. The Cavs also were missing the injured J.R. Smith and Kevin Love. Plus, Deron Williams reportedly agreed to sign with Cleveland after a buyout from Dallas, but didn’t join the team yet. So the Cavs had a makeshift starting group of Richard Jefferson, Channing Frye, Tristan Thompson, Iman Shumpert and Kyrie Irving. The Bulls were without Michael Carter-Williams with tendinitis and Paul Zipser. It became a desultory start with both teams shooting below 30 percent much of the first quarter as the Bulls led 23-22. The Cavs behind Irving’s scoring on the run with 10 points led 20-14 before the Bulls got six straight points from Rondo for the first quarter edge. The Bulls gave Cameron Payne his first look to open the second quarter and he made a pair of threes basically playing off the ball, but had a pair of turnovers when handling. The Bulls took a 28-22 lead to start the quarter. James Jones answered with back to back threes and the Cavs pushed ahead 37-35 midway through the quarter. Then Wade gave the Cavs a taste of his spin moves and footwork for three scores as the Bulls led 49-46 with 2:46 left in the first half. Former Bull Kyle Korver heated up late in the half and the Cavs took a 56-55 lead at halftime, making eight of 19 threes. The Bulls made eight of 15 threes with the reserves four of seven. The Cavs continued to swing the ball looking for threes, and came out shooting with three Irving scores to take a quick 65-59 lead. The Bulls then went to Butler, who has played passively on offense in the first half of games lately. Butler’s baseline jumper started an 11-0 run for the Bulls for a 70-65 lead that went to 76-67 after two Butler three pointers, one as the shot clock expired. 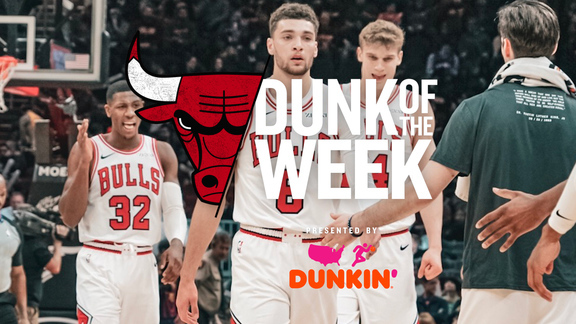 Butler added another down the stretch as the Bulls went into the fourth quarter leading 89-76 with Butler’s 13 third quarter points and a Rondo high arc scoop at the buzzer. Irving had 26 through three. Then the Bulls began to break it open to start the fourth quarter with Cristiano Felicio rolling in for a score on a Wade pass, Mirotic doing the same and then a Valentine three for a 98-78 Bulls lead with 9:14 left in the game. Though the Cavs answered right back with a pair of threes and kept coming with more aggressive offense. Though the Bulls held them off with crucial jump shots from Felicio and Rondo and still led by 10 with three minutes remaining.